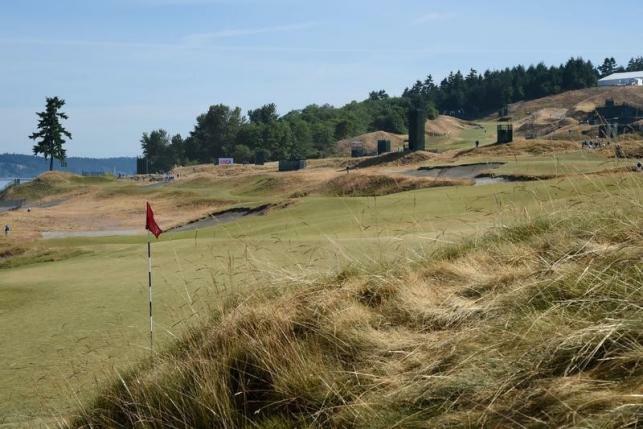 UNIVERSITY PLACE – US Open organizers were preparing for the likelihood of four days of mainly sunshine as the 115th edition of the year’s second major got underway on the links-style Chambers Bay layout on Thursday. Local PGA Tour professional Michael Putnam struck the first shot on the par-four opening hole and England’s Jason Palmer began proceedings at the par-four 10th to launch the first US Open to be played in the Pacific Northwest. Masters champion Jordan Spieth was among the late starters, scheduled to tee off with 2013 champion Justin Rose of England and Australian Jason Day from the first at 2:17 p.m. PT (2117 GMT) in one of the most eye-catching trios of the day. Spieth will be seeking his second major crown after clinching his first in sensational fashion at the Masters in April when he completed a wire-to-wire victory by four shots to match Tiger Woods’s tournament record low for 72 holes. Woods, who has been struggling for form and won the most recent of his 14 major titles at the 2008 US Open, was also among the late starters, set to begin at 2:28 p.m. (2128 GMT) with fellow American Rickie Fowler and South African Louis Oosthuizen. Fans have several mouth-watering groupings to watch in the early morning, among them five-times major winner Phil Mickelson, American Bubba Watson and Argentina’s Angel Cabrera. Mickelson would be a hugely popular winner at Chambers Bay this week where he is bidding to claim his national championship for the first time. The American left-hander has been runner-up at the US Open a record six times, most recently in 2013 when he finished two shots behind Englishman Rose. In keeping with tradition, tournament officials placed defending US Open champion Martin Kaymer of Germany in the same group as the reigning British Open champion and the reigning US Amateur winner. Kaymer teed off from the 10th hole along with Northern Irish world number one Rory McIlroy, a four-times major winner, and South Korean amateur Yang Gunn.